Pumping on trains, particularly in Europe, can be quite a pleasant experience. The process is nearly identical to that for pumping on an airplane, but typically there is more space to spread out. In my experience, the best solution is to secure a window seat, in first class if at all possible. First class on trains is beneficial because of the extra legroom and because it tends to be more sparsely populated than the economy sections. As I do on planes, I pump at my seat on trains. As with my experiences on planes, I have never had anyone give me any trouble at all for pumping on a train. 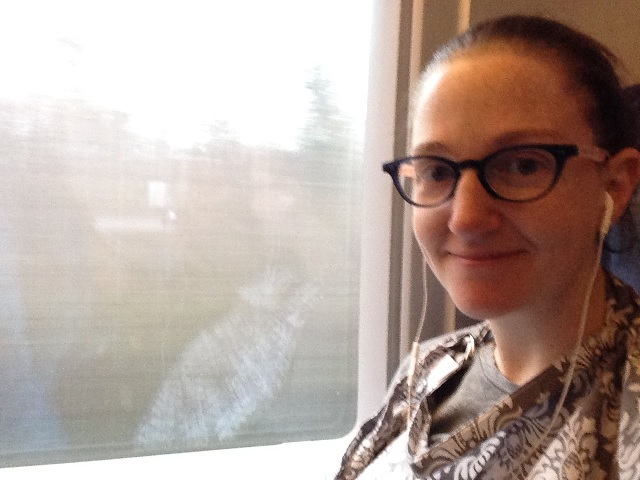 Pumping on a train bound for Geneva, October 2014. To pump on a train, I first determine if there is any type of tray table available. If there is one, I will use it just like I would on an airplane. Otherwise, I either use the seat next to me (if it is empty) or put the pump on the floor. Unless you have the appropriate power outlet for your pump, use the battery pack. I do not recommend plugging your US pump into any plug outside of the United States or Canada. The process for setting up and pumping is again identical to what I do on a plane. I put the assembled pump parts in my lap and then put the pumping bra on over my shirt and unhook the clasps on my nursing bra. Then, I put the nursing cover over top and set myself up. If the train is dark, I use my mobile phone’s flashlight feature to make sure that the flanges are properly aligned. I hook up the pump tubes under the nursing cover and turn on the pump. Once I’m done pumping, the clean up process is the same as with any location. Generally, I put the milk bottles on the tray table and clean myself up first so that I can remove the nursing cover, because it makes it easier if I am not trying to keep myself covered up while putting the milk away. Typically, I wipe the used parts off and store them in a mesh bag (separate from my supply of clean parts). If I am going with a DIY ice pack solution, I will then head to the train’s club car (or dining car) and ask for ice (see Transportation). 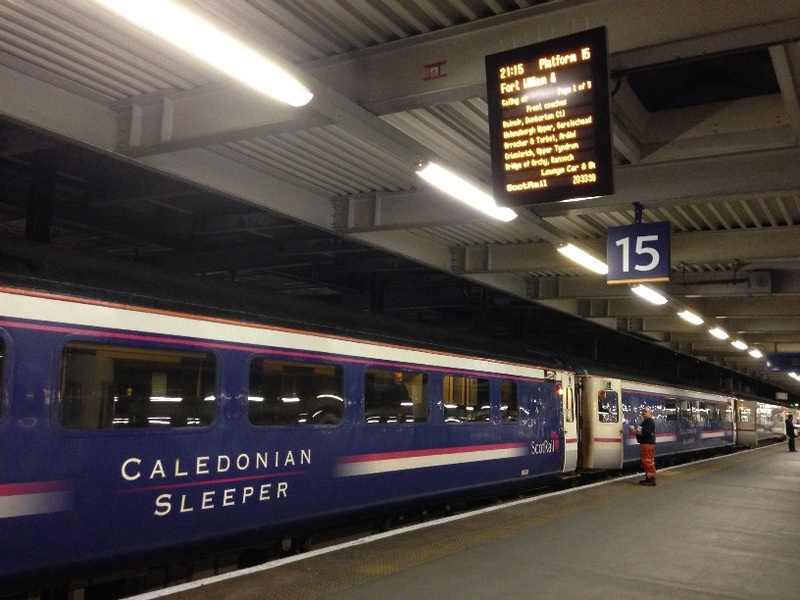 Overnight train to Aberdeen, January 2015.